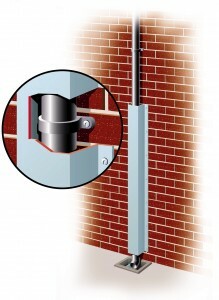 Cut the cost of replacement bottom sections of vulnerable downpipes and wires/aerials. It also prevents them being climbed (anti climb) for illegal access to property. The protectors may also be used as a ducting for cables and conduits. Pipe/Wire protectors are supplied in galvanised steel in 2.4 meter lengths with fixing holes at 300mm centres. Variations of profiles and lengths can be made on request for all of our downpipes, wires, cables and aerial protector covers (ask about anticlimb). MATT BLACK IN STOCK NOW. OPTIONAL POWDER COATING IF REQUIRED. CAN ALSO BE FABRICATED TO SUIT ANY DIMENSION AND LENGTHS. READY IN 2/3 WEEKS. IF POWDER COATED 3/4 WEEKS. For more details please click the pdf, alternatively contact Stuart or Phil on 01942 715678, who will be able to answer any questions you may have. This item and many more are available in our online shop, see the categories to the right, click the link below or click ‘Shop’ at the top of the web site.